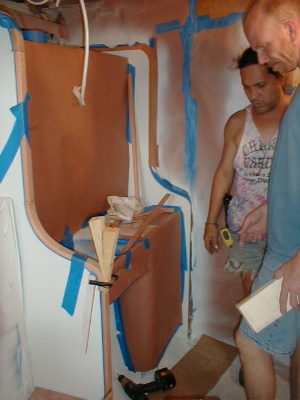 May 17, 2002 The spring peepers have had to crank their volume to be heard over all the sanding and sawing at the Cherokee site. 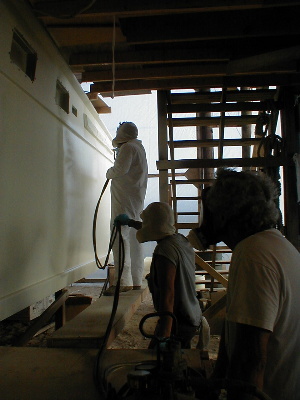 While new-kid-on-the boat Kerry sands the profile around the side windows (below), the paint crew has spray painted both sides of the hull with Awl Quick and sanded it in anticipation of the final prime before the top-coat. 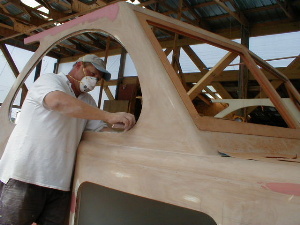 Much headway has been made on Cherokee’s hardtop, as the corners have been cut, curved, and trued-up for fiberglassing. 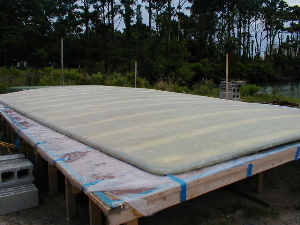 A layer of Kevlar and a layer of fiberglass have been applied to the top. 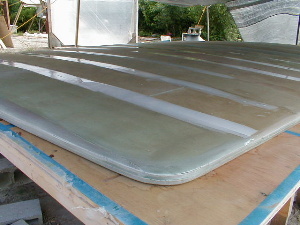 Next the hard top will be turned over so the underside can be fiberglassed. 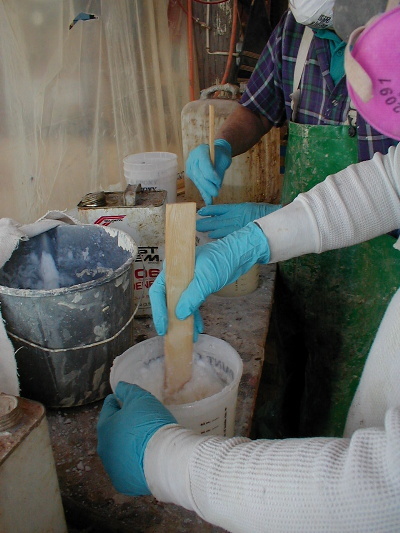 Let the epoxy flow! 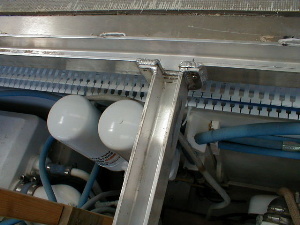 An aluminum framework, fabricated by Hancock and Grandsons of Harkers Island Road, has been installed in the engine room. 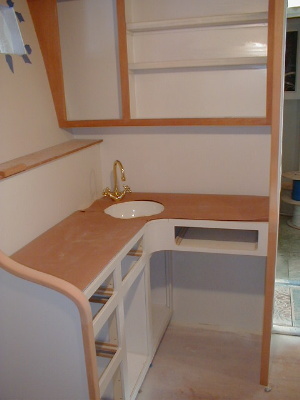 The framework provides a structure for the cockpit deck, as well as guttering for the hatches. This framework will hold four hatches, one over each engine, one over the generator, and one personnel hatch. 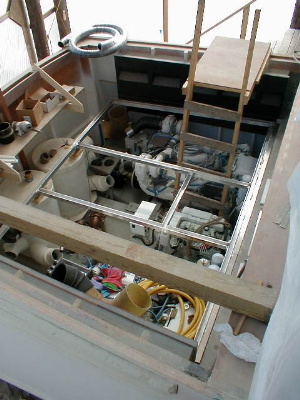 The hatches are all supported by the framework. 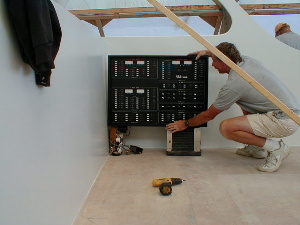 The center section of this framework can be unbolted and all hatches removed in case re-powering is necessary. This will make maintenance easier too. Electrician magician Steve is depicted below holding the soon-to-be installed electrical panel. Beneath his left hand is the air conditioner air-handler. Forward is the shore power chord reel. 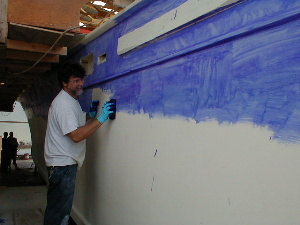 Note that the interior walls of the pilot house are now white. The next coat here will be top-coat. 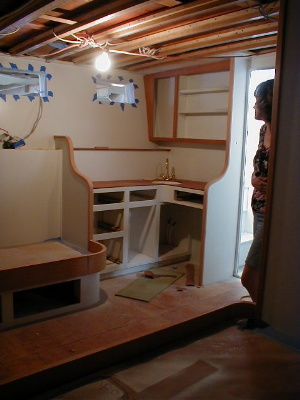 Interior trimwork hums along, with Tom Parker custom-making and fitting each piece. Jeanette has been repairing the old drawers that will be re-used. 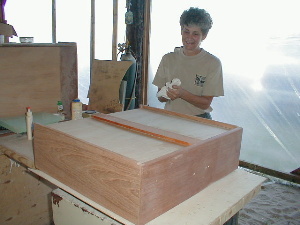 She’s put new bottoms in them, and is putting new mahogany faces on the ones that are damaged.